We just found out they are trying to hide the comments to the proposal. The comments aren’t their idea – it’s a LAW they have to abide by … taking opinions of the public into consideration. The NRC is a federal agency. CONTACT YOUR SENATORand tell on them! Why should i go to nukepro? All I saw there was vote Trump, and Kavanaugh should be approved. Trump controls the NRC. Trump is deregulating nuclear waste transportation and storage, as well as reactor safety. What kind of passive-aggressive gobbledy-gook is this? Trump is also in with Abe, who is opening dangerous plants in Japan. This was a repost from flying cuttlefish picayune. There is no need to go anywhere else. 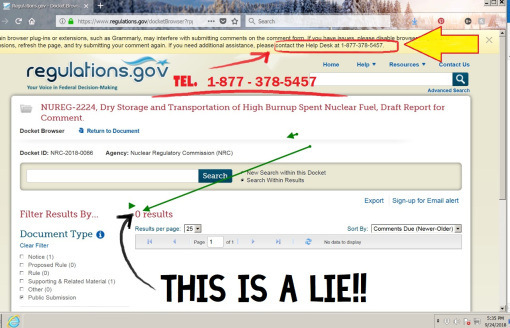 Anyone can use the link provided to go directly to the NRC. the site you mention was not until the very end, and very few people go that far. AGR does not agree with Nukepro in any way, shape or form, except for his focus on being anti nuclear. The best part about the US is that we don’t have to agree on every issue, but we can find agreement on certain issues even with those that we differ with in other ways. Isn’t that the essence of democracy, after all? Isn’t that how the ‘founders’ set up the US political system? Yes, there are several very good sites around as you point out, but none of them teach the Science of Sustainable Health, nor do they predict what is coming. Knowing the science of sustainable health, plus who will win, and how that battle will be won is worth something, wouldn’t you agree? There are no real-antinuclearist sites that are not into sustainability. Trump is not into sustainability. His followers want to kill off the last of endangered species. They are subsidizing old nuclears and coal plants, instead of investing in renewables. They are keeping old reactors open. The are supermilitarizing. They are deregulating bad reactors, that are close to failure. They want to deregulate all corporate poisoning, for the completion, of the poisoning of everything. They want to criminalize any dissent against their goals. How can u believe your own nonsense? Destroy everything, let all the reactors blowup, let nuclear waste be spread everywhere for a sustainable world. Now we have heard everything. In this patriotic society u advocate there is no dissent. It is already jere man. Wake.up! If u say anything about nuclear, or leaky oil pipelines you will be drug away in chains, or summarily executed. Things will not always be as they are now. Unless you have the experience of Oneness, there is no way to comprehend it logically. Call it all nonsense if you want to, duality consciousness will end someday, and the birth of something new is happening now. Nuclear energy will not be part of the future as it is anti life. You are correct that all true anti nuclear sites are also into sustainability, but many sustainable organizations are totally corrupted or taken over from the inside by fossil fuel or nuclear shills at the very top. How deeply have you gone into this subject? Not everything that appears one way on the surface remains that way if you dive more deeply. That is a bit of an insult, to grass roots people. People who have gotten reactors closed. My friend Ace Hoffman and I, and others have put in the hours to get reactors closed. There are real grass roots people on twitter. Trump is criminalizing opposition to corporate interests. Oil, nuclear or what have you. When he is through, there will be no end to the psychosis. Funny how the white, racist boys are up in arms about the arrests at the pipeline in dakota, and then all proTrump . Have you put in the work, of writing the government, going to meetings, going to court to get reactors closed or nuclear waste dealt with? Conspiracy fibs and Alex Jones propaganda. Pawns in a game . A political game, to brainwash ya, to enable extreme corporatist war criminals. That is how this creep got in. The other part of the duopoly, not so great either but the insanity is quickened now. Most of this internet posturing is pretty fake. What grass roots antinuclear, are taken over by oil? Please list them Dr, or what ever you are. Is this the same Dr Goodheart that started this site? The worst nuclear catastrophe ever, happened in Fukushima. America is very close to that and more. Who would want to live in that aftermath? Seriously. Looks like Cuttle Fish is trying to do something. More power to him/her. Best wishes. All I am saying, is that corporations are very active, in getting people like Trump to criminalize dissent. The nuclearists have never cared, about the will of the people or democracy. They are deregulating dangerous plants. They are doing as they please, with the worst nuclear waste, as I write.